Vegas Casino Online has been around since 1999. Being a Real Time Gaming-powered casino, Vegas Casino Online caters to US players allowing them to play real-money games. The gaming establishment is founded and operated by Main Street Vegas Group Casinos. It is the oldest company running RTG-powered casinos such as Sun Palace and Las Vegas LA Casino. As a standalone RTG casino, Vegas Casino Online offers a full range of the developer’s games. They include slot machines, virtual table games, Video Poker variants, specialty games and even Live Dealer tables. A total number of games is about 250, which is not very impressive given that some modern gaming venues offer over 1,000 casino games to choose from. However, it is a safe and fair gambling destination where US players can try their luck and win even a progressive jackpot provided they are lucky enough. When it comes to bonuses and promotions, Vegas Casino Online has a lot to offer. New customers can make use of a hard-to-resist welcome package consisting of a 150% welcome bonus up to $3,000. It can be used on slots, Video Poker and other games. To claim it, you need to make a minimum deposit of $20 and enter the code IDBVEGAS. A wagering requirement of 40x the deposit plus bonus applies. Another welcome bonus a new player can claim is a 400% bonus up to $500. You have to enter the code 400BONUS and a wagering requirement of 50x the deposit plus bonus applies. As for existing players, they can take advantage of multiple daily promotions. They include reload bonuses, cashbacks, free spins and more. The casino also offers monthly, season, birthday, anniversary and daily bonuses as well as a loyalty programme. As you advance up the scheme, you can enjoy a more rewarding gaming experience with bonuses subject to lower wagering requirements. If you have ever played in an RTG-powered online casino, you will use Vegas Casino Online without difficulty. Players are offered to download free software and install it on their desktop or enter the website through their web browser. RTG is well-known for the stability of its platforms, so you can enjoy the games without lags regardless of the platform you choose. However, the download platform offers a larger number of games as well as slot tournaments you can join and compete with other players for the top prize. 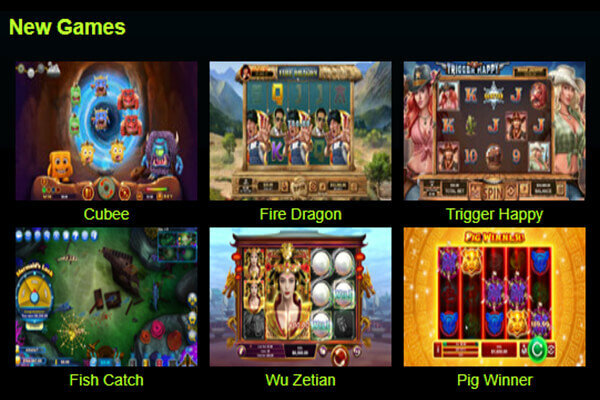 Slots are the most numerous games with new ones added on a regular basis. Some of the most popular titles you can play here are those from the Real slot series including Cleopatra’s Gold and Count Spectacular. Players can give the latest titles like Plentiful Treasure or Naughty or Nice III a try and enjoy exciting and potentially rewarding bonus features combined with improved graphics. A number of progressive slots are also on offer. Apart from those from the Real series offering Minor and Major jackpots, players can try their luck on the games like Aztec’s Millions, Megasaur or Spirit of the Inca awarding mind-blowing prizes. The Table Games section offers 15 titles including different Blackjack variants, Three Card Poker, Rummy and more. Two table games offering progressive jackpots are included in this section as well, Caribbean Hold’Em Poker and Let ‘Em Ride. If you are using the download version then you can also enjoy Live Dealer casino games. The gaming establishment supports a variety of usa banking methods you can use to fund your account and clear your winnings from it. 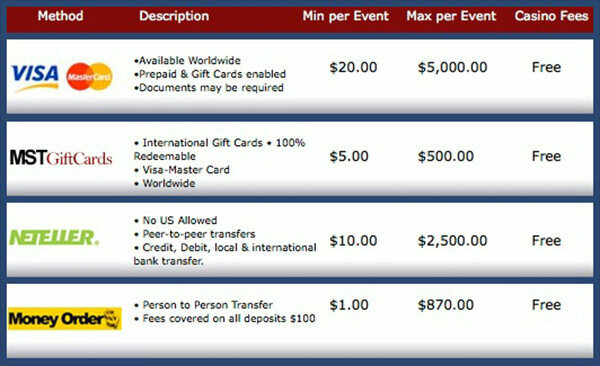 When it comes to deposits, the supported payment options include Visa and MasterCard, MST Gift Cards and Money Order. Neteller is also supported, but US players cannot use it. A minimum deposit varies based on the selected banking method and can be from $5 up to $20 per event while a maximum starts at $500 and goes all the way up to $5,000. You can easily tell by its name that Vegas Casino Online is inspired by the gambling capital of the world. Although the idea behind it is ambitious, the casino fails to execute it with a rather simple design in shades of blue. There is nothing here that will make you feel like you are playing at a Vegas-based casino. At least, in terms of its appearance. On the other hand, the games are nicely put into categories, just like at other RTG-powered gaming venues. 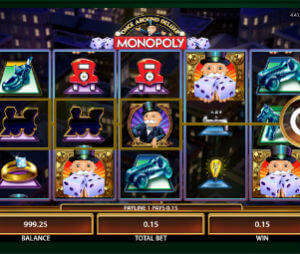 The casino runs on three platforms – download, instant-play and mobile. It’s up to you which one you will use. Just like other gaming venues operated by Main Street Vegas Group Casinos, this one was established by the laws of Panama. The casino has earned a solid reputation among players for treating them in a fair and safe way. It is certified by CDS, a testing agency that evaluates the fairness of the gameplay. Vegas Casino Online has it’s pros and cons. It is reputable and fair, however the number of games is not huge and the payouts take a bit longer then some other USA online casinos. The bonuses are generous, however, it turns out they are not that attractive when you know that wagering requirements are set high, at 40x or 50x the deposit plus bonus. While allowing US players to enjoy a variety of real-money casino games, Vegas Casino Online supports some of the most convenient banking options in the US market. They are not as convenient as e-wallets or modern instant banking methods, but knowing that the US market is not regulated yet, it is a solid range of solutions you can use to carry out your transactions safely. In addition, you will be covered 24/7 if any problem happens thanks to round the clock customer support.